The Red-tail Round House sits on top of a Moraine with spectacular views. The location is ideal for getting off the grid and enjoying private trails on the tranquil side of the Continental Divide. Steamboat is about an hour away. 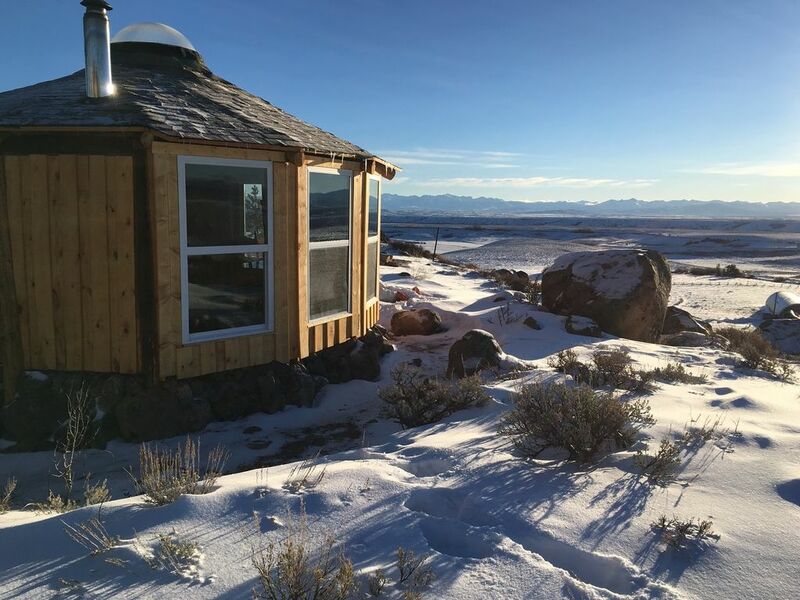 The Red-tail Round House sits on top of a Moraine at 9000 feet. The views are spectacular from the large windows! The Medicine Bow Range is to the east, the Park Range to the west, Rabbit Ears to the south and Mt. Zirkel to the north. Sunsets and Sunrises are beautiful. Star Gazing incredible. Parking is 100 yards below. The trail is packed so winter foot apparel fine however snowshoes are nice to have if you want to hike around in the winter and when snow levels increase. There is a fire ring and inside a wood burning stove to keep you warm and toasty. We supply your firewood. Food can be warmed on the wood burning stove. Dutch oven provided. No electricity or water. Lantern with phone charger is provided. We also provide water. Compost potty house is attached. The space is over 200 square feet. The beds are bunk beds. Table and chairs. There are trails on site for hiking, biking, snowshoeing, xc skiing, & horseback riding. Our newest trail is the Elk Run which is snowmobile packed for winter non-motorized recreation and in the summer is a great hiking trail into Routt National Forest. We are 5th and 6th generation to this land. We are wildlife rehabilitators for the northern mountain region. 22 West enables us to support ourselves and care for injured and orphaned wildlife. We built this cabin ourselves over a period of 7 months. Lots of heart and soul went into it's creation. Sitting at 9000 feet with views in every direction makes you feel on top of the world. Wildlife is often seen from moose, deer, elk, fox, bear and many species of bird. The bathroom is a compost potty attached. The shower house is a short walk away. This little yurt/hut provided a perfect romantic get away. This place is surrounded by windows and incredible views! The wood burning stove kept us plenty warm at night and it was one of the best places I’ve stayed at. I would highly recommend this place to anyone for a night or even a week and the hosts were very accommodating and pleasant to meet. What a fun and unique place to stay! Can’t wait to go back! We had a great stay at this vacation rental. If nature, quiet, and simplicity are your bag, this is the place to go. Great hospitality and accommodating owners. We really enjoyed our stay at the cabin! Deb was a fantastic host and welcomed us to the cabin and showed us the way in and got us all situated on the basics of the cabin. I did my homework on the location and realized that this is a place and location that you want to show up prepared for, which really adds to the enjoyment. It's remote. Deb pointed us toward a new trail that was really close to the cabin and made for a fun snowshoe adventure for us and the dog. I will be back to this place and am already looking forward to it! I would stay here over anywhere else in Colorado! Please check your weather before heading out. Mountain conditions can change quickly. The Jackson County Road dept. does not plow on weekends or holidays.